Amazon sells several Kindle models in Canada, including the Kindle Touch and Kindle 4. The WiFi only touchscreen model costs $139 and the 3G plus WiFi version costs $189. The non-touch Kindle is $109, and they still sell the keybaord model too. Check the main Kindle reviews page for all the details on each model, and check the article below for Canada specific information about the Kindle. Kindle Canada users have access to over 460,000 ebooks from the Kindle Store. New release and bestsellers typically cost $11.99, and there are 135,000 titles priced under $5.99. Amazon's ebooks are primarily English-language, but there are few foreign language titles, including over 2,000 French ebooks. Like the US version, Kindle Canada users have the option to download content directly to the device using the free wireless that connects to Amazon's online store. If you live somewhere that doesn't have a wireless signal, or if it's your preference, you can always download content to your computer and then transfer it to the device with a USB cable. In fact, it's probably a good idea to download Amazon's new software application, Kindle for PC, if you'd like to get a better idea of how their ebook store works using your computer. You can learn more about Kindle for PC on our free software page, and find the link to download it. While Amazon offers a wide selection of titles, it's important to understand that a Kindle is a closed content device. You can't purchase ebooks from other major online sellers like with Sony Readers, with the exception of DRM-free ebooks. Picking up the free wireless service, Amazon wants you to download books from them exclusively. However, you can find a number of websites that have free, non-DRM protected ebooks that will work on a Kindle International just fine. Project Gutenberg Canada is one example of a local website. For more information regarding content—ebooks, newspapers, and magazines—visit our dedicated Kindle eBooks Page. Amazon has over 135 US and international newspaper and magazine subscriptions available, including several Canadian Newspapers: The Vancouver Sun, Globe and Mail, National Post, The Motreal Gazette, Edmonton Journal, Ottawa Citizen, Regina Leader-Post, Windsor Star, Saskatoon StarPhoenix, Victoria Times Colonist, The Province - Vancouver, BC, and Calgary Herald. The free wireless gives users in Canada access to Kindle's online store 24 hours a day. There are no monthly charges, wireless contracts, or roaming fees. In addition, Kindle International users outside the US can access Wikipedia with the free wireless, but access to the internet with Kindle's experimental web browser is limited to a few countries, and it is unavailable in Canada at this time because of current cellular bandwidth issues and increased wireless costs. For the most part, wireless service is limited to the southern regions of Canada and Alberta. Light purple is EDGE/GPRS coverage and dark purple is 3G coverage. The map is too large to fit below, but you can click on it to view coverage closer up. 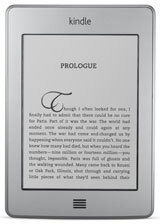 The Kindle for Canada is available exclusively from Amazon.com, and it's important to note that all orders, including ebooks and other content, are processed in US currency. The Kindle Touch sells for $189 USD for the 3G model and $139 for the WiFi only model, which equates to about the same in CAD. The regular Kindle 4 without a touchscreen sells for $109. None come with a cover, which is highly recommended. A good cover sells for about $30 USD, but you can find them for as low as $10. In addition, shipping usually costs around $21, and there is an additional import fee of about $31 or so. So the grand total of Kindle Canada will cost about $241 USD without a cover. Applied to the current conversion rate that equates to around $245 CAD for the 3G model and $195 for the WiFi version. This biggest knock on Kindle is that it isn't an open device and doesn't support a wide variety of ebook formats. However, there are a few options for getting around this for non-DRM files. For DRM encrypted files, the Kindle International supports Amazon's proprietary format: AZW. For unencrypted files it supports PDF, TXT, MOBI, and PRC. In addition, Amazon will convert these unencrypted files to their AZW format: PDF, HTML, DOC (Word), RTF, JPEG, GIF, PNG, BMP, MOBI, and PRC. More info can be found on the Kindle Format Conversion Guide. You can choose to convert these files on your own with free conversion software like MobiPocket Creator and Calibre. With Calibre you can also convert unprotected EPUB ebooks downloaded from various sources like Google Books.